There is just so much that I have to say that I have to do the thing I always do and put them into numbered paragraphs. There's just no way to make this flow as a narrative so it has to be in list format. I feel like I need to apologize to all of you for the lack of creativity that has been going on around here. I'm sorry. I'm working on it. But, for now, you get numbered paragraphs. 1. Thursday night Grant came home with a present for me. A Sprint Evo 4G. It is leaps and bounds beyond my blackberry and I'm so happy. And addicted. And I can't put it down. Grant is so sweet and I squealed like a 9 year old girl getting to meet Justin Bieber. 2. Friday we went out to my parent's house for burgers. It was so much fun. Lindsee came out for a visit. When she left, my niece Grace shut the door behind her and said "She was very very nice". I agree. Lindsee is very very nice. I had to take a picture of this moment. Grant (in the beautiful hunting hat) was giving fishing tips to Grace. 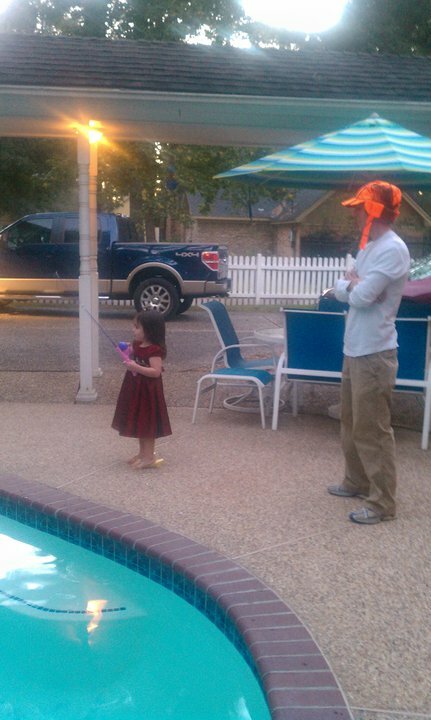 Grace is using a pink fishing pole. In my parent's swimming pool. Wearing a party dress. And heels. 3. Saturday I slept in (holla!) and then drove up to church for the "Band and Singers" retreat. We ate yummy bagels from Panera, worshipped, workshopped, played "Minute to Win It" games, ate Mission Buritto for lunch, and then played this crazy game that my partner and I WON. And what did we win? WE WON A $25 GIFT CARD TO TARGET THANK YOU VERY MUCH. The options. The choices. The decisions. I've decided on Christmas decor for my home. Bless. 4. Saturday afternoon I slept for a long long time and watched "The Millionaire Matchmaker" which is a train wreck that you can't look away from. It's shocking and horrible and I have so many opinions for all of these people that I can't even begin to write them all out. I could start an entire new blog and fill it up for three years full of opinions I have for the entire cast of characters of that show. At the end of each post I would have a 5 second video clip of me sitting on my couch, shaking my head and saying "What is wrong with people?". 5. My ankle is not as healed as I originally thought and I may or may not have taken a step backwards with the cute boots I wore Saturday night. Oops. 6. Saturday night was date night. Sadly, we were both a little bit snappy and didn't really enjoy our evening till about 3/4 way through when we both decided to start over and smile at one another. We saw "Due Date" which I don't really recommend. It had funny moments but definitely was not my favorite. 7. AND THEN WE DID SOMETHING CALLED DAYLIGHT SAVINGS FALL BACK DAY AND THAT MEANS WE GET AN EXTRA HOUR OF SLEEP AND JESUS LOVES ME THIS I KNOW. 8. Church was so nice this morning. We got to class early and visited with a new couple. We had an excellent teacher who taught us all about being patient. I am sooooo good at being patient. Then we went to church where Pastor Gregg taught a sermon titled "He Must Become Greater, I Must Become Less" which I totally don't need to hear because I am super good at humility and submitting to His will. Or, truthfully speaking, the sermon (nail) was very timely for me (hit me on the ever-loving head). 9. Immediately after church I had a parent meeting for the Kids' Choir. 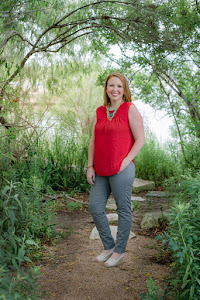 Just in case you haven't been here to read in awhile and are thinking "Holy Moly, did Jen the Newlywed have a baby that is now in the 1st-5th grade that she is going to parent meetings for and I totally missed it?!?". No, no you didn't miss it. I have no babies. I am, however, a co-director of the kids choir and we had a parent meeting today. In a room that was freezing cold. And the people in the hallway had pizza that smelled so good that I almost ate my notes. 10. Grant and I decided to go home for lunch and see what we could whip up. Grant grilled hot dogs. We had no hotdog buns. So I toasted some bread and we had a hot dog sandwich. With Fritos. PURE CLASS. 11. We went to the gym and I worked out my abs and they are now abs of steel. A really loose, cushy steel. 12. Grocery shopping trip to Randall's. (Your Remarkable Store). We got lots of fruits and veggies. When we went down the macaroni and cheese aisle I touched all of the beautiful boxes and told my babies that I missed them and that I think of them every day. 13. Grant made us dinner. Whole Wheat Penne pasta with grilled chicken, broccoli, carrots, garlic, and olive oil. And I made Pillsbury Crescent Rolls, because, as previously stated, I AM A CLASSY GAL. 14. I did two loads of laundry. Well, 3 loads of laundry if you count the sheets. We love sleeping in freshly washed sheets. They smell so good. 15. We took the puppy dog on a long walk because it could not be more beautiful outside. This blog post must end now before I start telling you all the meals I will be eating this week and how they compare to all the meals I wish I was going to be eating this week. My favorite part of my weekend was seeing YOU. And your peeps.